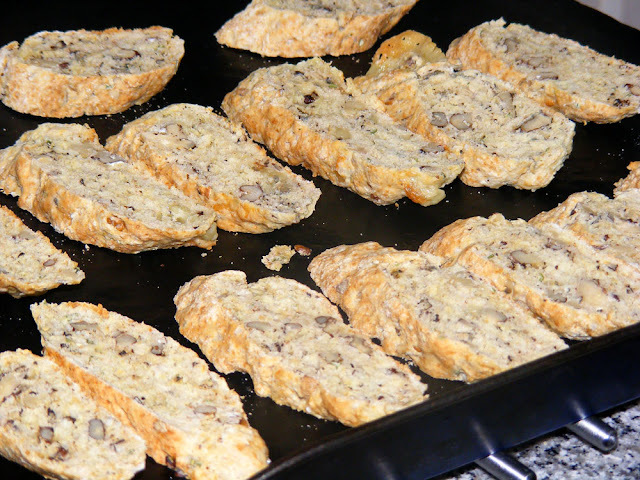 We anglophones tend to think of biscotti as an Italian classic, but actually these hard crisp biscuits exist in other European culinary traditions too. In France they are called croquets or croquants by people in conversation and by artisan bakers, although in the supermarket they will often be labelled 'biscotti'. A friend made some to hand round after a botany outing. She was bemused by me apparently suddenly switching from French to Italian, and told me the biscuits were called croquants. The recipe below is my savoury take on the subject, using local tourangeaux ingredients. Roast the nuts in the oven for about 8 minutes. Grate, crumble or chop the cheese, depending on its consistency. Remove the nuts from the oven and allow to cool. Leave the oven on. Mix together the flour, cheese, maize meal, sugar, baking powder, baking soda, salt and piment d'Espelette. Roughly chop the walnuts and add to the dry ingredient mix. In a separate bowl beat the eggs with the buttermilk and thyme. Pour the wet mixture into a well in the dry mixture and work it with a fork and then your hands until it forms a fairly stiff dough. 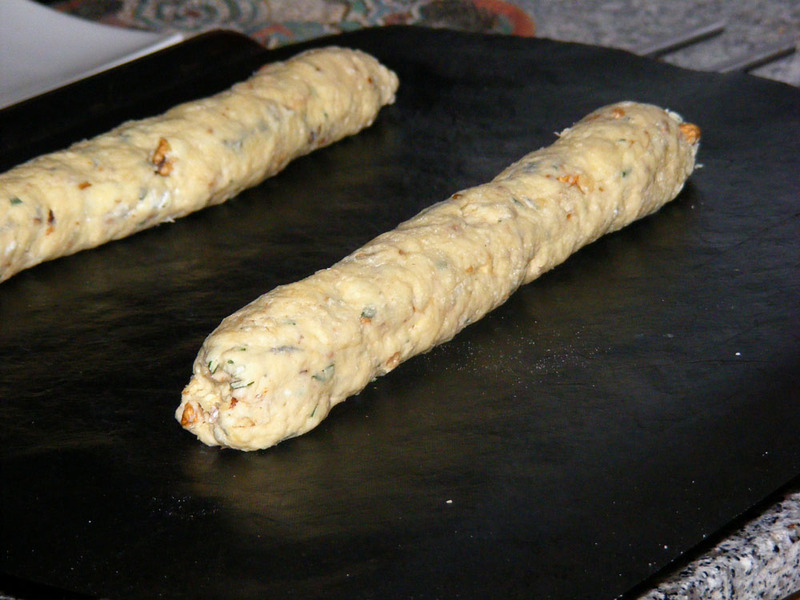 Roll each quarter into a sausage about 25 cm long and put on an oven tray lined with a silicone sheet or baking paper. If it is a bit sticky, sprinkle the work surface with a little flour. Space the logs about 10 cm apart and use two trays. Bake for 20 minutes, then remove and cool for a couple of minutes. Turn the oven down to 100°C. Using a bread knife, cut the logs into slices. Angle the knife diagonally to get long oval slices. Put the slices back on the lined oven trays and put back in the oven for 30-40 minutes. You could replace the walnuts with pine nuts. 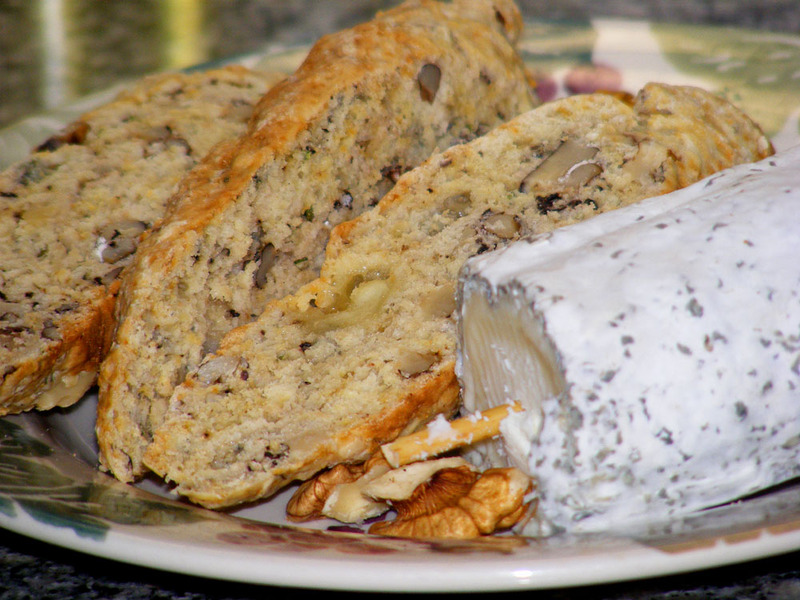 Any cheese will work so long as it doesn't have too high a moisture content. Maize meal is a flour made from ground maize (corn) that you might use to make tortillas. It is sold under a variety of names but it is not 'cornflour' (aka cornstarch) or polenta. If you can't get it, just use extra wheat flour. Piment d'Espelette is a mild chilli powder from the Pyrenees. It's expensive and not available everywhere, so use hot paprika instead if you want. If buttermilk (lait ribot or lait fermenté in France) isn't available where you are, use plain yoghurt. The eagle-eyed amongst you will have noticed that it is rosemary in the photo, not thyme. That is because I don't have a thyme plant at the house and getting some for the photo would have involved going down to the orchard to cut some thyme. Rosemary is very nice in this recipe as well. 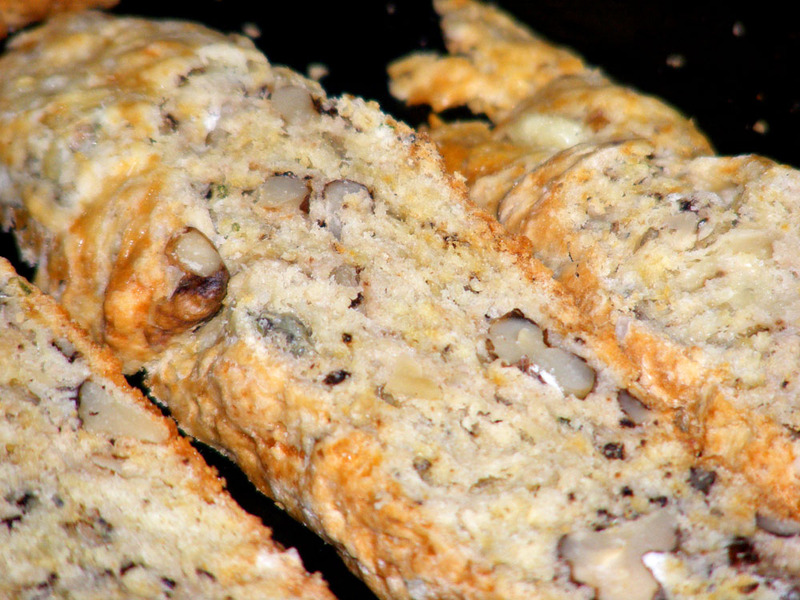 The biscotti (as us anglophones would call them) will not be as brittle as the classic sweet version, because of the cheese. They are very savoury and moreish though. Just recently Yohann Sionneau, our local river technician got in touch with me. He'd been reading the blog and thought he might be able to clarify some of the details of what his job entails and how he goes about managing the Claise river and its tributaries. 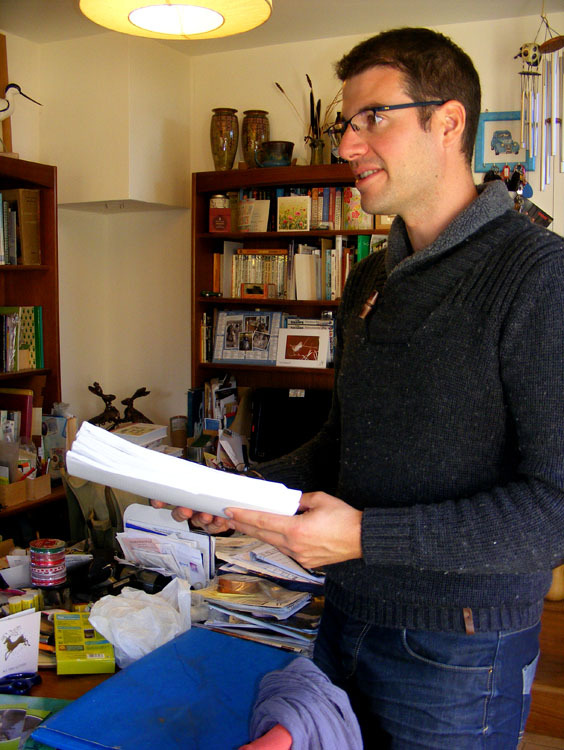 Specifically he wanted to talk about how he has to tread a fine and diplomatic line between a number of stakeholders, and every management decision or action is inevitably a compromise which is the best possible he can achieve after negotiating with the elected officials of the Communauté de Communes de la Touraine du Sud (his employer), landowners along the river (mostly farmers), special interest groups (such as the watermill owners or the anglers associations) and EU regulations (such as the Fresh Water Directive). Tim suggested the caption for this photo should be 'The sky's the limit!' He and Yohann are talking about how Tim manages his site in the Aigronne valley. Yohann was extremely complimentary, referring to it as the 'lungs' of the valley. More or less the whole valley has been declared a ZNIEFF, but Tim is one of the few landowners taking the conservation of the protected area seriously. Yohann appreciates that greatly. When he was studying ecology he naively thought that when he graduated his job would be to get out into the field and practice ecology. It's been rather a rude awakening to realise that ecology is about 20% of his job. The rest is administration (office based paperwork) and local politics. He commented that admin and politics were not even touched upon in his university course. He's not the only river technician to make a similar remark to me. These young guys (all the ones I know are male) started in their newly created river technician jobs in 2011 full of idealism and zeal. Very quickly they've discovered that not everyone they needed to influence, advise and work with had an approach or ideas that coincided with theirs. It was a crash course in realpolitik that continues to this day. Luckily the rewards and satisfactions of the job still outweigh the frustrations I think. 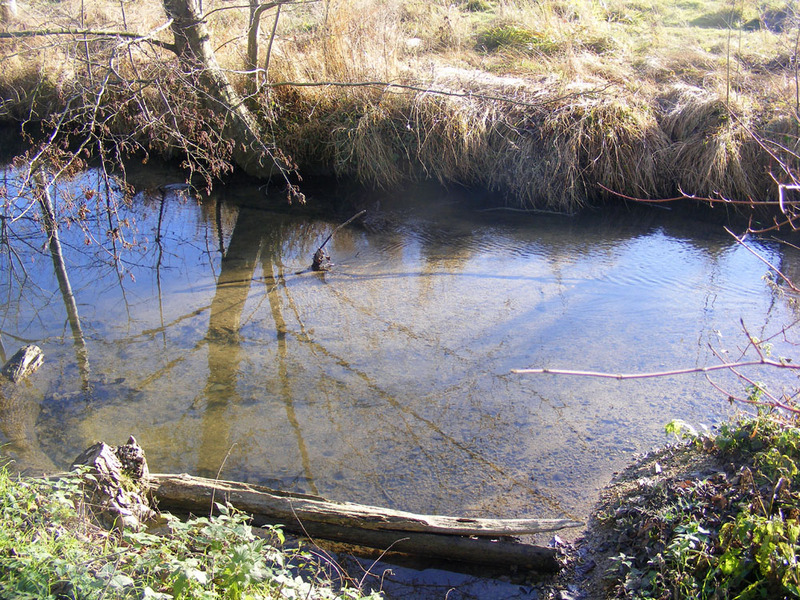 This is part of a millstream flowing through friends Tim and Pauline's property. The millstream itself is owned by local farmer Richard. He and Tim have discussed dredging the far side of the stream to improve habitat and flow. Mention of that set Yohann's alarm bells ringing slightly and he requested that if any work is to be done that he be contacted. He thinks it is probable that the millstream is classified as a cours d'eau ('water course') which means that permission must be sought from the authorities (ONEMA - Office National de l’Eau et des Milieux Aquatique – National Agency for Water and Aquatic Environments). He can act as an intermediary with this. Yohann's job is to improve and maintain the health of the rivers in the Claise valley catchment area. 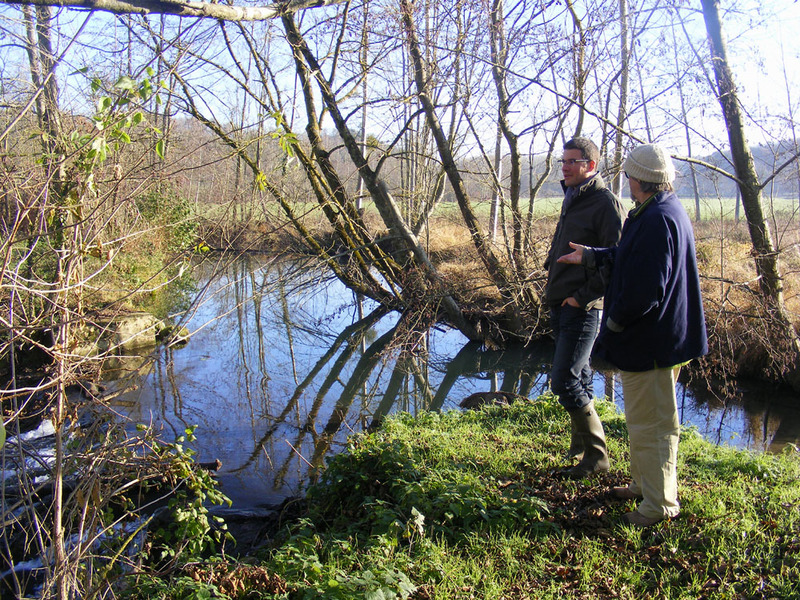 He is responsible for 312 km of water courses, including the main tributaries of the Claise, the Muanne, the Aigronne, the Rémillon and the Brignon. His role is a combination of practical field work such as surveying fish populations and providing the labour and equipment for lumberjacking and earthmoving, as well as advisory, where the landowner wishes to undertake the work themselves. He began by compiling a hefty report on the state of the rivers in the system, and as the first five year plan comes to an end, he is documenting progress and outcomes. The next five year plan is in the pipeline and will be at least as thick as the initial one. Its focus will be on pollution, particularly agricultural runoff and silt, as well as maintaining all the gains of the previous five years. A weir on the Aigronne River. Yohann plans to repair it with a light touch, strategically dropping a few locally sourced rocks in the river to form a series of stepped pools so that trout can continue to move up and down the river. The first really obvious action Yohann took was to contact landowners with proposals to selectively clear vegetation along the river banks. He hoped this would be a way of building trust between himself as an ecologist with an eye on the big picture health of the river and the mostly conservative private landowners involved in agriculture along the river. As it turned out, sometimes it worked, sometimes it didn't. He is hampered by mostly only being able to provide advice with no powers of compulsion, and by the way the project is funded, where landowners can unwittingly be rewarded for either ignoring or misinterpreting his advice and removing desirable riparian vegetation, both living and dead. 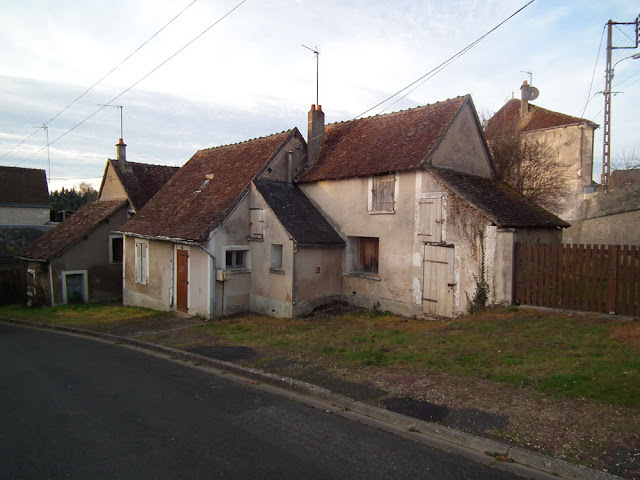 There is an unfortunate predisposition on the part of many French landowners to want everything tout propre (all clean and tidy), which is not helpful when it comes to managing and maintaining biodiversity. 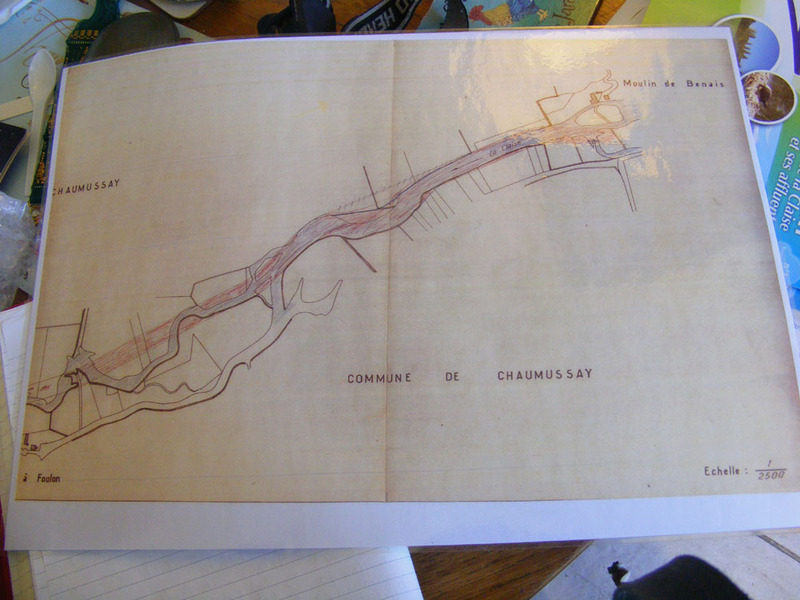 A map showing how much the course of the Claise has been canalised and straightened at Chaumussay. The blue indicates the old course of the river, the red the modern straightened course. I have to admit, I can't work out which section of the river this is (I can't find the Moulin de Benais on Géoportail). Yohann remarked that between Chaumussay and Le Grand Pressigny the river is exactly as he would want it to be, but nobody gets to see it because the banks are not accessible. Part of Yohann's job is to identify trees and vegetation that needs to be removed from the river banks, but also to identify vegetation that is beneficial to the health of the river. The removal of trees should be done on a case by case basis, generally speaking only removing trees that are unstable and constitute a risk. He has poplar plantations in his sights because they are often planted too close to the banks, and with their regimented rows and shallow root systems are very susceptible to wind damage. 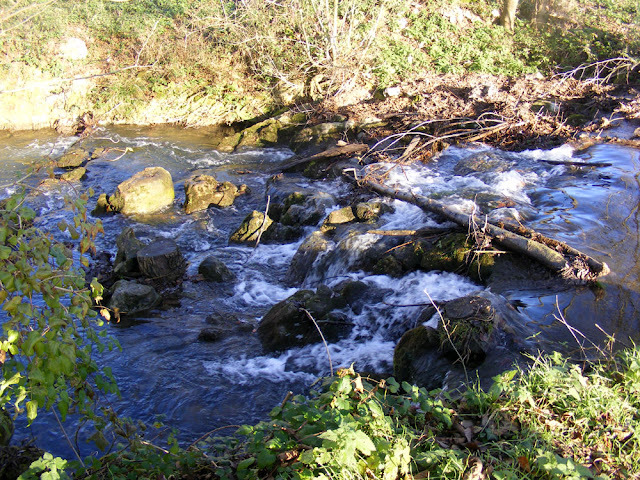 If uprooted there can be damage to the river banks, leading to them becoming destabilised. They are also often not harvested in a timely manner and get too big and old, leading to even more likelihood that they are unstable. Tim F and Yohann discuss river management where the Aigronne River has been divided to form a millstream going off to the right and the main course of the river goes off to the left. Having learnt a lot about communicating with landowners Yohann is now focusing on some other ongoing aspects of the rivers' management. One is the control of the invasive species* such as Water Primrose, and periodically his team physically remove as much as they can from sections of the river. Second, he is monitoring the fish stocks and is hopeful that the Federation of Anglers can be convinced not to release any more captive bred trout into the river. His surveys show that 17 out of 21 trout caught are wild born and he feels that the wild population should be allowed to build up without competition from the annually dumped captive bred fingerlings. Third, he feels that much of the river is too wide, canalised and slow flowing. He wants to makes sure the tributary rivers particularly become sinuous, bubbling and oxygenated. The trout in the Rémillon and the Aigronne will benefit from this. 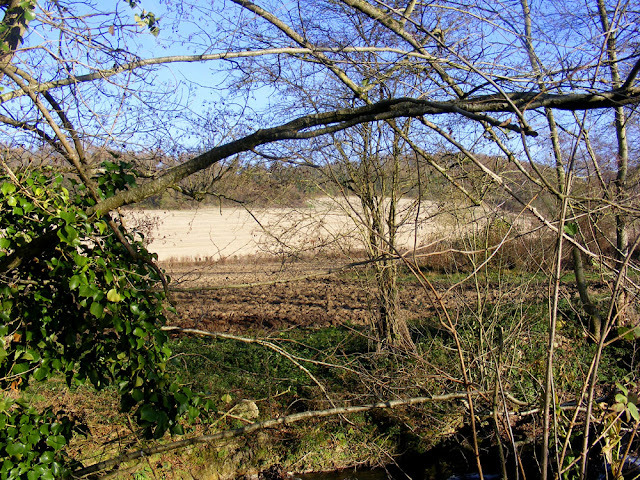 A typical example of poor agricultural practice along the Aigronne River. The field in the foreground was until last year a water meadow, with pasture for grazing animals, and a large population of the rare and protected wild flower Snakeshead Fritillary Fritillaria meleagris. Now the grass has been ploughed up, presumably to grow a cereal crop, and all the trees have been felled along the river bank, probably because they shaded the field and would interfere with cultivating a crop. 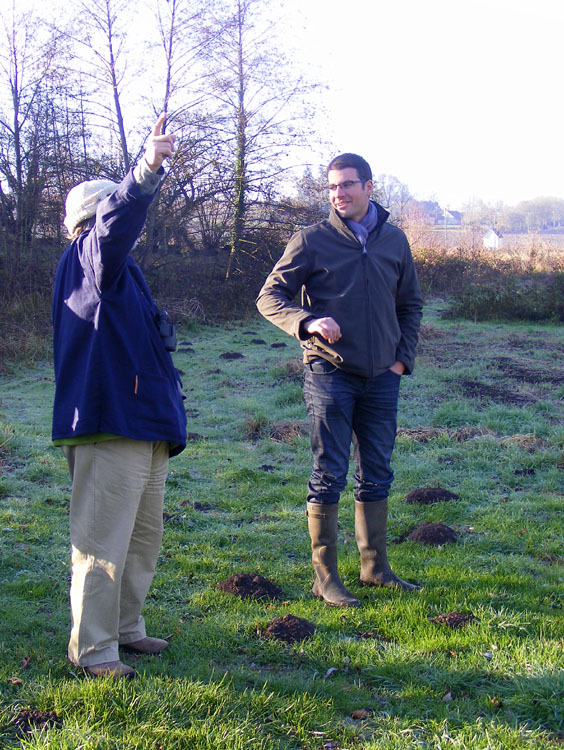 This farmer can expect the banks of the river to start eroding and a build up of silt and pesticides in the river due to runoff from the field. Despite the plant and the land's protected status nothing can be done to stop the farmer engaging in 'normal agricultural practices', a category which is specifically exempt from the protection legislation. To achieve the last aim he has a cunning plan which he hopes farmers will be only too happy to help with, since he is willing to buy field stones which the farmers would otherwise see as a nuisance and pile up to one side. He wants to dump the field stones, which are identical to the stones already in the rivers, at strategic points in the river to act as banks and bars, forcing the water to twist around them and bubble over them. To a large extent he is set on undoing major canalisation work that was undertaken in the 1960s. Prior to the modifications in the 1960s these rivers flooded to some extent every year or so. Riverside landowners were used to it and expected it, but the works in the 1960s were designed to eliminate these floods. They were very successful at doing so, and landowners became less habituated to maintaining water meadows and suitable trees along the river to mitigate the effects of flood such as erosion of banks and the depositing of silt. Now that the river didn't flood they felt safe to plough up the meadows. Cattle grazing was less financially rewarding that cereal growing. Some of them stayed livestock farmers, but more and more the animals were kept in sheds and fed cereal grown on land that was once down to pasture that the animals would have grazed. Others switched outright into cereal growing as their source of income, and either way the river flats were ploughed up. Yohann with his mahoosive report on the Claise River. This year, with the biggest flood since records began in the Claise valley, farmers lost their crops on these riverside parcels. Plus a lot of their soil, fertilizer, fungicides and insectides will have been washed down the river and the banks undermined by the increased flow. If the land had been still just growing native unimproved grasses, the land would have been able to sponge it up, the plant roots would have held the soil in place and filtered out any chemical runoff. The European Fresh Water Directive was issued in 2000 and the stated aim was that 100% of European rivers should be in good health by 2015. Despite the best efforts of professional ecologists like Yohann this just hasn't happened. The percentage of rivers that have met the targets is currently under 20%. The budget for the Claise and its tributaries over the last 5 years was 1.85 million euros. The budget is divided into three main categories. Heavy works such as the removal of Water Primrose, river bank vegetation, depositing field stones, removal of the old public swimming pool in the river at Le Grand Pressigny and the restoration of the site, fencing and stock watering facilities consumed 1.064 million euros. Another €261 000 was spent on outreach, and finally €95 000 on biodiversity surveys. The problem is proving complicated not so much on an ecological level, but on a psychological level. The project is necessarily extremely consultative and the stakeholders have a wide variety of backgrounds, concerns and motives. In the long term it will only succeed by continuing to be consultative in this way, but this method of working is slow and can be frustrating for observers and stakeholders alike. Yohann needs to keep a clear head and an even temper. He tells me that certain people who disagree with his approach have insulted him to his face. This is a small community where people tend to know one another and have a personal relationship with their elected councillors. Yohann needs to be aware of local sensitivities and relationships which may have no obvious link to the project but may still influence outcomes. *The Communauté de Communes is also funding control of introduced aquatic rodents (coypu and muskrats) and Asian Yellow-legged Hornets as part of the rivers project. They have purchased 100 traps and provided training for anyone interested in using them to control coypu. Asian Hornets love to build their nests by water and the CCTS will also refund up to €150 on presentation of an invoice to destroy an Asian Hornets nest. 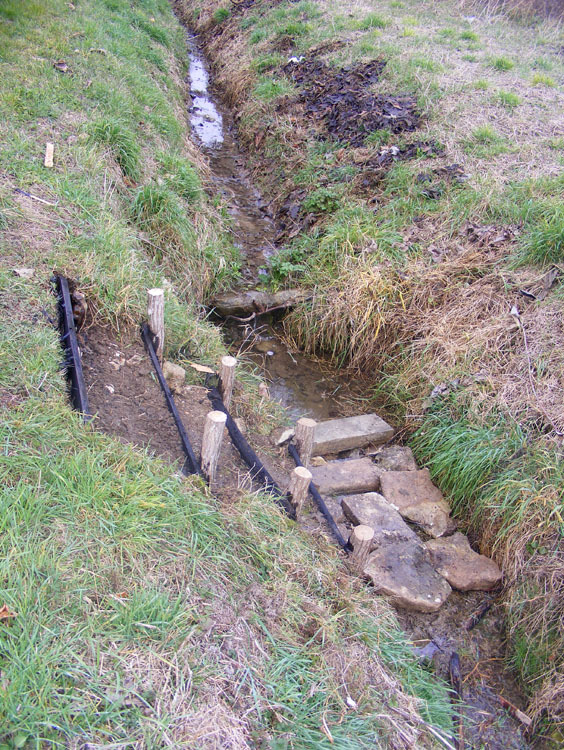 The Aged One was very pleased to tell me when I saw him at the market that he had repaired the steps that provide access into the small stream in front of our orchard. He's 'repaired' them before but not really made access any easier, so I thanked him but didn't really pay much attention because I wasn't expecting much. However, when I went down there I discovered that he has completely rebuilt the steps, plus made a place to stand in the stream. This means I will be able to use the water much more easily. I may have to bake him a cake. Technically this is probably illegal, but the stream still flows through (until someone upstream pumps more than their share off to water their vegetables in the summer). 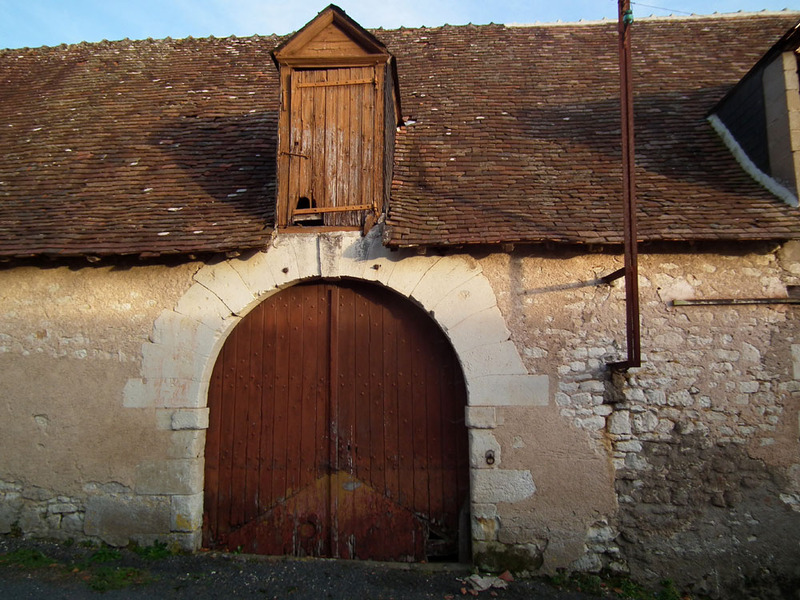 I like the stylish old repair on the bottom of this courtyard door. A neat and modest front door. 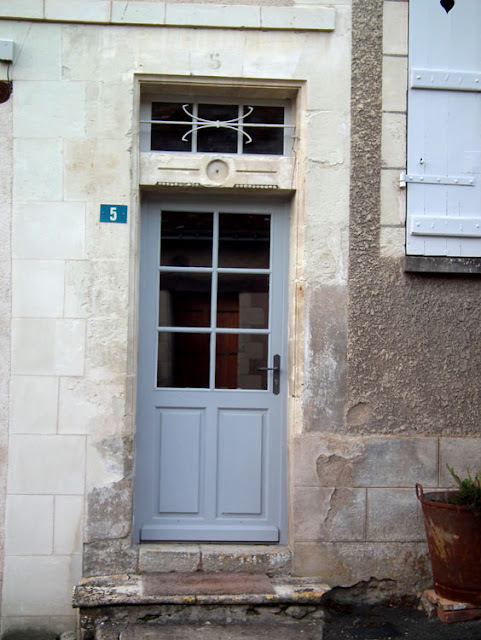 A more modern door with an older carved stone lintel. Check out all those red and yellow flags! They are marking orchid leaf rosettes in the vegetable garden. That's just the ones that were in this small area on 17 December 2016. Based on my experience of their appearance in previous years, there will be more by spring. These are all Ophrys spp, either Bee Orchids or Early Spider Orchids. I suspect there are three reasons for this explosion of numbers in the vegetable garden. The first is that I keep the grass shorter in here than the rest of the orchard, so they are easier to see. The second is that this area gets much more foot fall than anywhere else in the orchard. This means a bit more disturbance of the soil, which many orchids take advantage of. Last, rain at the right time in the early spring of the previous growing season is very important for many orchids, and this year we had an abundance of rain in early spring. A peek into some neat backyards. Do you see the old gable line on the building on the right? And the gnarled silhouette of a typically French pruned tree? A charming barn, with the church in the background. We would like to wish all our readers a happy and peaceful Christmas, with lots of yummy food and conviviality. 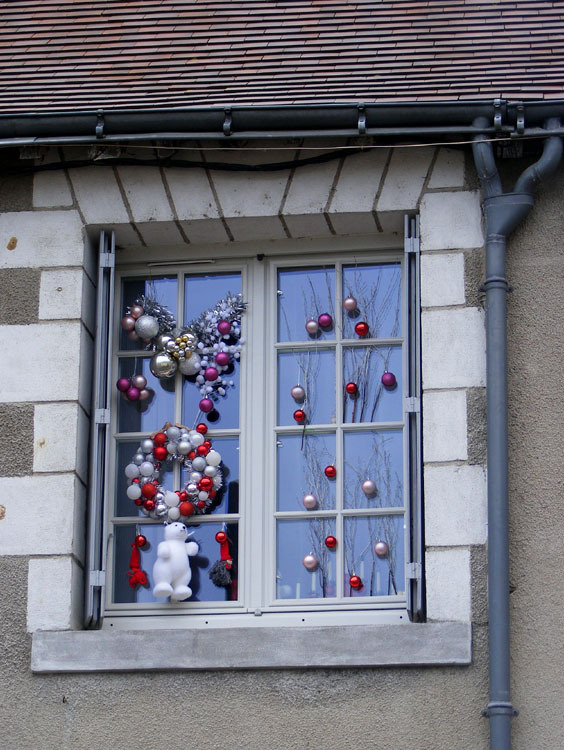 This is our 10th Christmas in Preuilly. The first one was spectacularly beautiful, with hoar frost everywhere. This one is very mild and a bit damp. Sunday was my birthday and Simon made me a chocolate cake. He doesn't especially like chocolate cake, but he knows I do. 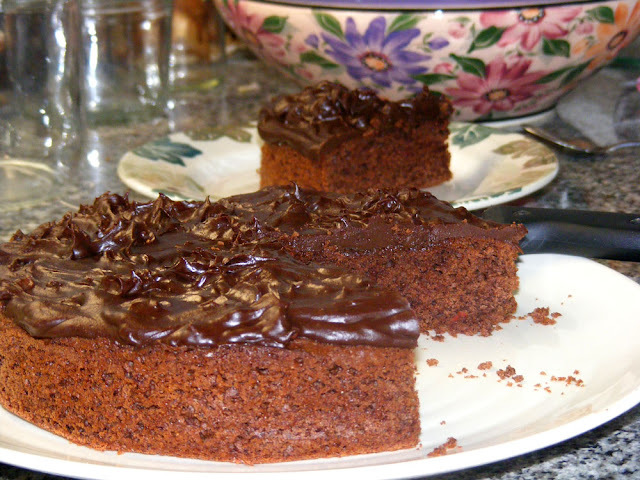 He used Delia's recipe for All-in-one Chocolate Cake, which neither of us have made before. He didn't entirely get on with it, as it didn't seem to make enough batter to make two cakes that would be sandwiched together, so he just made a single cake. Part of the problem was that we only had 20cm/8" tins and the recipe calls for 18cm/7" tins. You can see from the picture it is a perfectly respectable single layer, but would have been two really mean looking layers. After adding more cocoa powder than the recipe called for the batter was very thick, so he added a bit of milk. He commented that you can tell how old this recipe is by the parsimonious quantity of cocoa suggested. A modern recipe would have at least twice the amount. To ice it he used leftover chocolate chilli ganache that was in the freezer. This had originally been made for his 'saints and sinners' cake club offering. It worked perfectly on my birthday cake. Flat terracotta tiles on a roof, with some age, lots of lichen and moss. 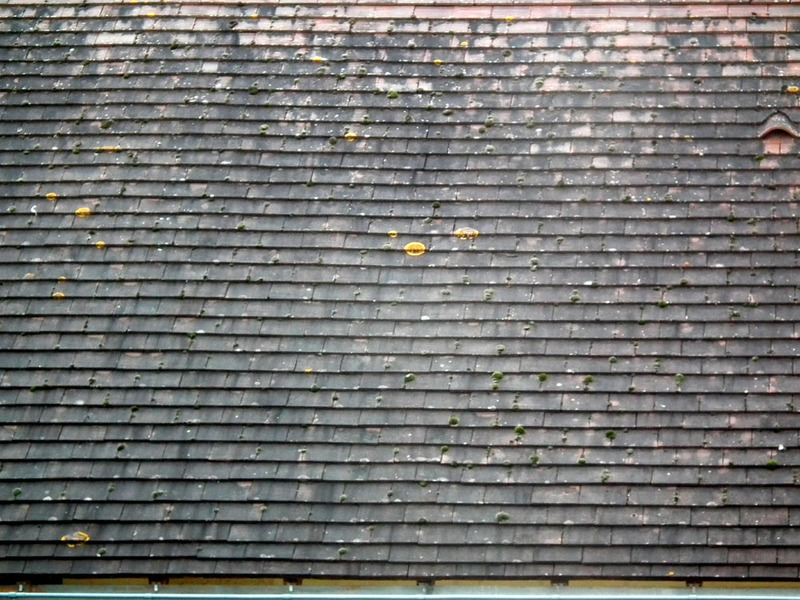 Theoretically you should clean off the growth to keep your roof in good condition, but hardly anybody bothers. Note the lack of gutter, which is traditional for here. Gutters are rather a modern affectation, and the old buildings can suffer if the soil around them dries up due to water off the roof being collected and piped away rather than being allowed to fall on the ground about half a metre beyond the walls. A nice smart slate roof on a tower peeps out above other long low roofs of slate or flat terracotta tile. The tower roof is finished with 'zinc' (actually pewter type alloy or galvanised steel). There is a decorative pattern in the slates (usually created by hanging the slates on a different alignment) and a monogram on the chimney of forged iron. 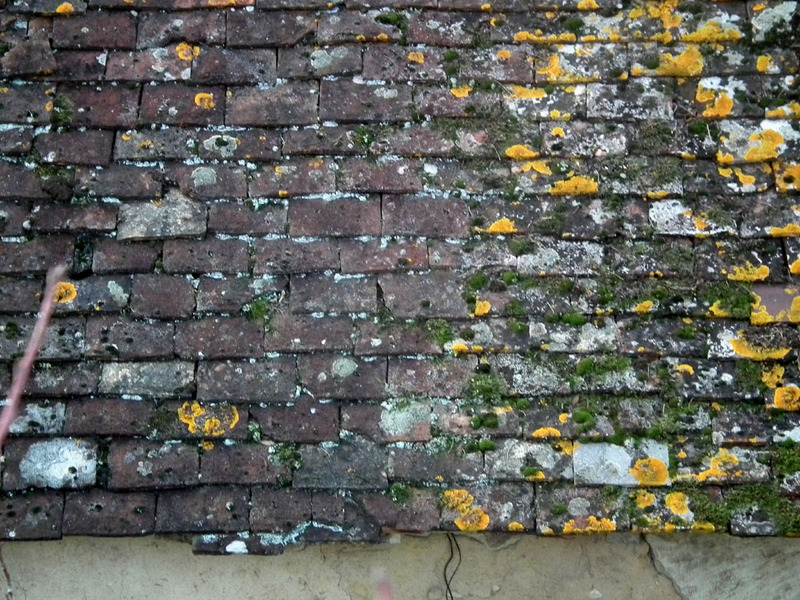 Another flat terracotta tile roof (with a bit less lichen and moss). On the right is a special curved tile with is for ventilation. I was trawling the internet the other day, looking for old photos of Preuilly just in case an old photo of our house came up. So far that search has returned no results. Something I did find was a photo of a car painting workshop. It looks absolutely typical of the sort of building you would find in Preuilly, and I can think of a number that still look like that. However, none of them match the slope of the roads or the corner with the cast iron drain (although another look at the drain suggests it might be stone...) many of which still survive in town. My best guess is that it on the site currently occupied by the ambulance service's garage - certainly the road slope look about right, and continuation of purpose is always a consideration - but there is no corner there! with his horseless carriage, and the chap in the straw hat and equally racey car. So it it Preuilly sur Claise at all? The information with the photo is very definite about that, but I am starting to have my doubts. None of Roger Lezeau's articles in the "Cahiers de la Poterne" mention Santory, and the name doesn't crop up in any of the books or online resources I have seen. I would love to know... I don't like not knowing trivial stuff. This house is clearly making use of all its attic space, with doors into every little lean-to and extension. These little doors which must be accessed by ladder probably mean there is no internal staircases to take up valuable space on the floor below. 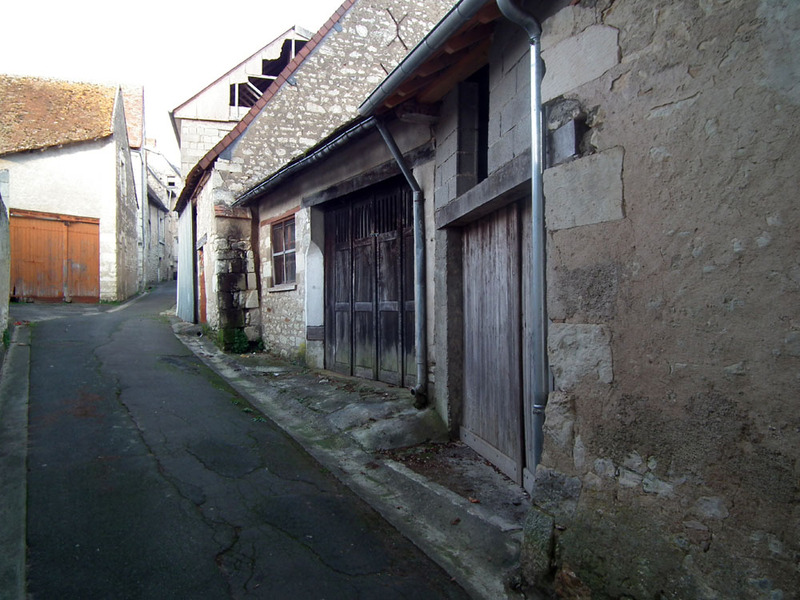 A narrow street with garage doors at odd angles, possibly to facilitate access and egress. Loire Valley Nature: A new entry has been added for the ubiquitous Bulbous Buttercup Ranunculus bulbosa. A photo of the lawn at Candé has been added to the entry for Cowslip Primula veris. A new entry has been added for the mainly southern species Sweet-scented Virgins Bower Clematis flammula, which is rare in the Touraine. Every year we get together with friends in early December to prepare our foie gras for Christmas. 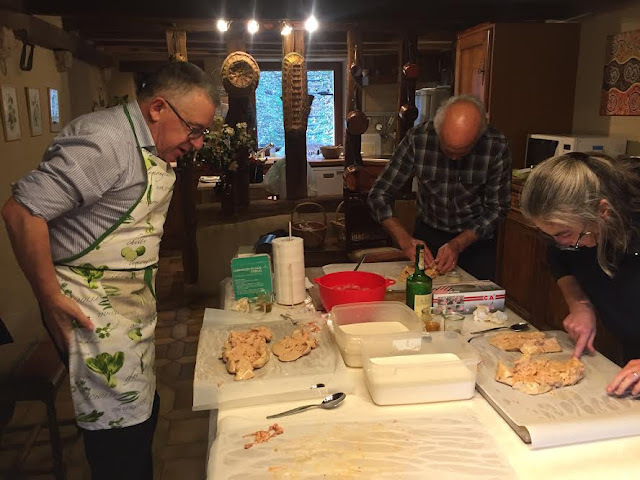 It involves having lunch at Rosemary and Jean-Michel's house and each of the three couples involved bring a course each. 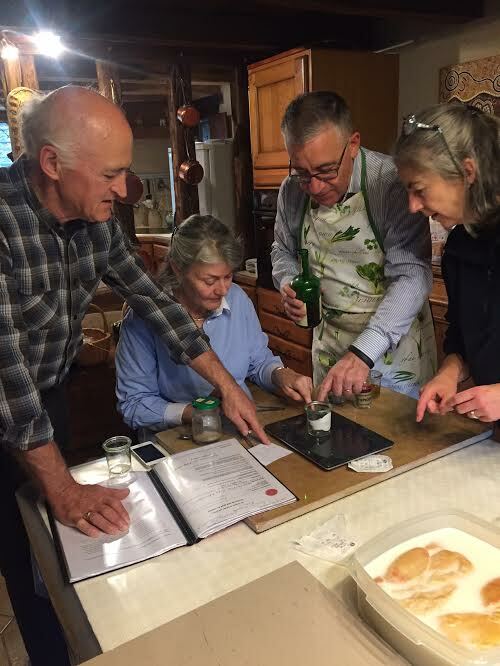 This year we were on starters, Rosemary and Jean-Michel made the main and Françoise and Paul brought the dessert. I made gravlax, using big pieces of trout rather than salmon. To my surprise when I came to buy fish for the recipe, salmon wasn't available in big enough pieces and trout was half the price. So trout it was, and I thought it was very successful. It's super easy too. The recipe is here. The most important thing is to have a truly sharp knife for slicing it thinly. 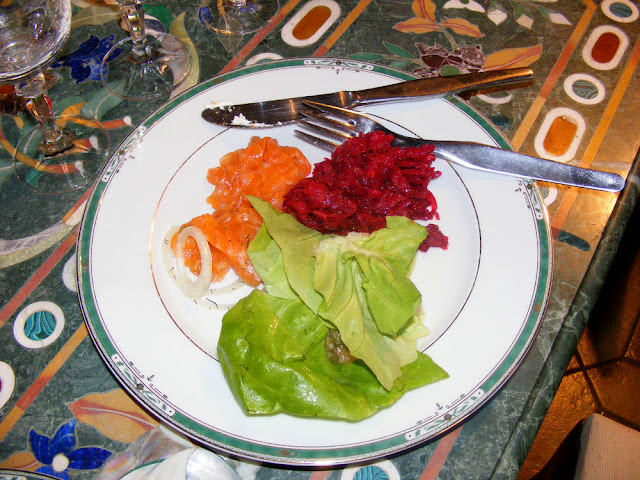 To serve with the gravlax I made carottes et betteraves rapées, which is one of my favourite salads. The sparkling Vouvray that Jean-Michel had opened for pre-lunch drinks went perfectly with it. 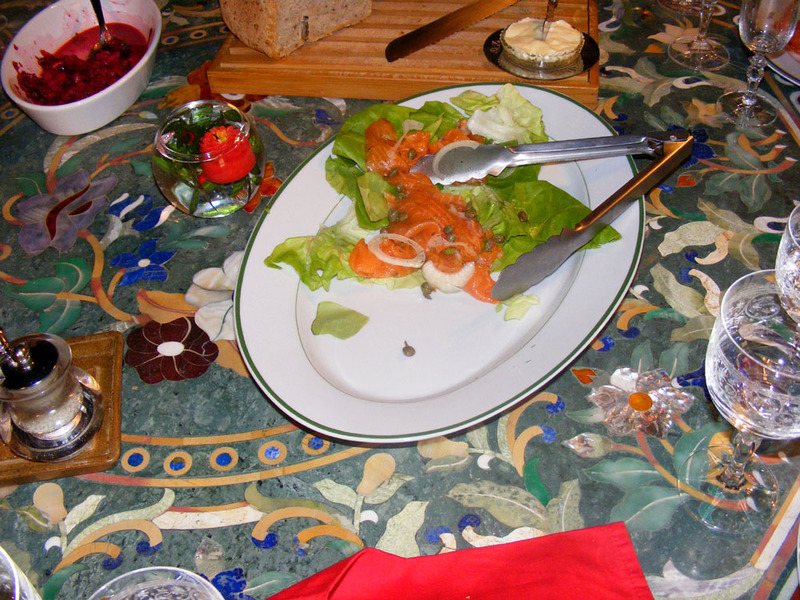 The Chablis he had thought might suit it (before he'd tasted the gravlax) turned out to be too dry. 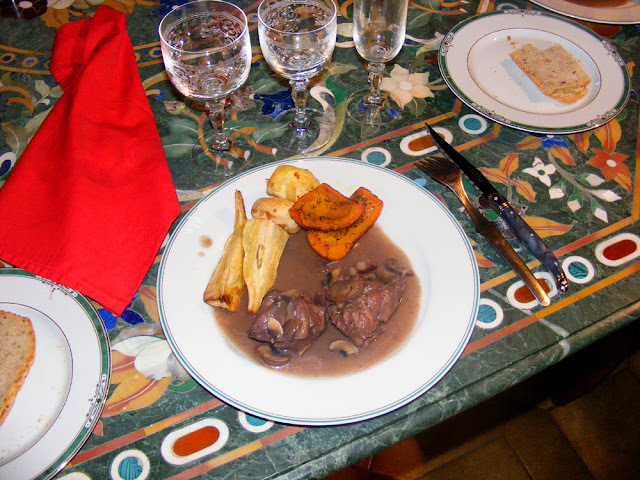 Jean-Michel made coq au vin and Rosemary did roasted parsnips, potato and pumpkin. Françoise had made a chocolate charlotte, which she said was a family recipe. 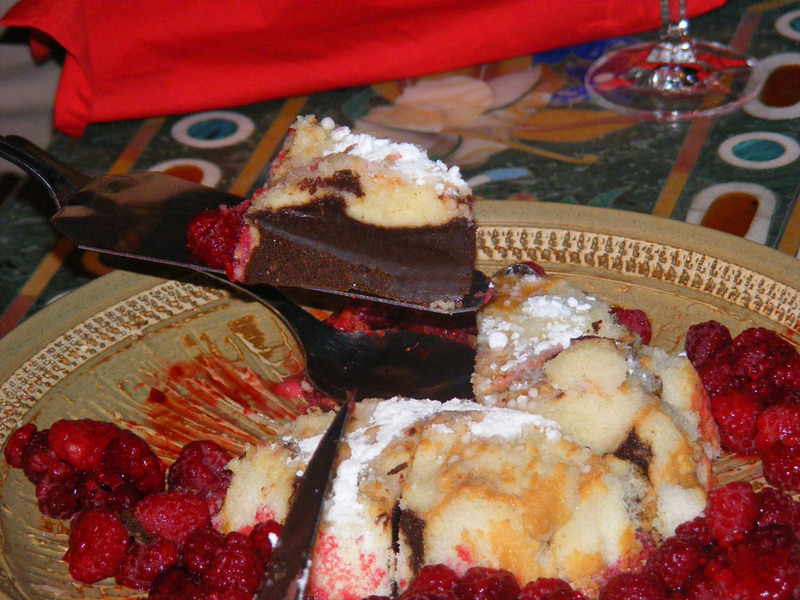 It was served surrounded by raspberries and was like a ganache inside. As usual we spent way more time eating, drinking and talking than preparing foie gras. All of us could quite easily prepare the foie gras at home in the course of an ordinary day, but it is so much nicer to come together and treat it as a winter celebration. A Passion for Baking: The Food Programme on BBC Radio 4 has featured the Clandestine Cake Club on their latest episode. You can listen to it here. 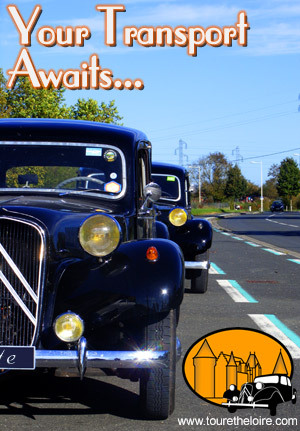 We belong to the Loire Valley chapter of the CCC. As in past years we went up to Blois at the beginning of December with three fresh foies gras in the esky to prepare them in the company of friends Rosemary, Jean-Michel, Françoise and Paul. I buy everybody's foie gras at our local duck farm and we have lunch at Rosemary and Jean-Michel's. This year Antoinette very kindly drove us up, as she is working up there two days a week. Part of the tradition that has developed is that she and Niall go halves with us on a foie gras. Françoise took these photos. I am very amused by all the pointing fingers in the top photo. It's because we are all doing maths to work out how much seasoning we need for each of the foies. Below Paul, Jean-Michel and I are deveining our foies. This might be the last year we all come together to do it. 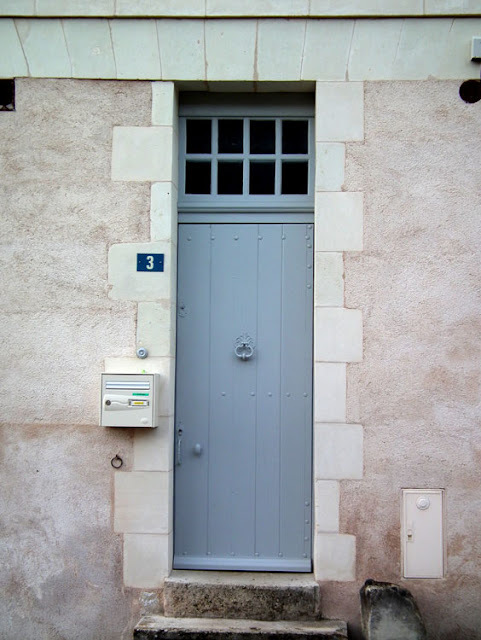 Françoise and Paul have seen an apartment in Saint Nazaire and are planning to sell their home in Blois and retire further down the Loire River to where it exits into the Atlantic ocean. Loire Valley Nature: A new entry has been added for the extremely common moss Rough-stalked Feather-moss Brachythecium rutabulum. A new entry has been added for Bush Vetch Vicia sepium, a plant of lush grasslands. 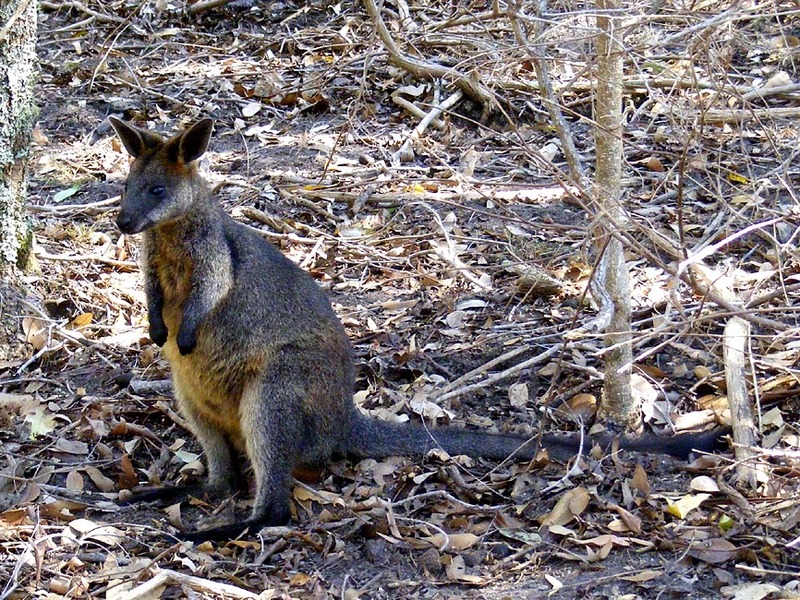 Black Wallaby Wallabia bicolor, also known as Swamp Wallaby, is common on the east coast of Australia. They live in dense forest undergrowth. Weighing about 15 kg and 75 cm long (plus another 75 cm of tail) their gait is rather more horizontal than other macropods. They browse a wide range of plants, including some which are poisonous to most animals. Luckily for it, the fur is coarse and its flesh has an unappetising smell, so it is not hunted. Our posts on Sundays have an Australian theme. If you would like to read more click here. Agriculture in the News: Yesterday I was watching the news and there was an article about how poor the year had been for farmers in France and Belgium this year. They interviewed a bunch of farmers who said that their yields were way down due to the weather. Those that relied entirely on cereals were down about 50%, those that had multiple strings (eg potatoes, beetroot) to their bow fared better, only being 25% below normal. Everyone has experienced low yields, low prices and poor quality crops this year. Apparently Australian and Russian wheat is pouring into the country. Catastrophe ! Loire Valley Nature: Photos have been added to the entry for the pretty little pea flower Bitter Vetch Lathyrus linifolius. 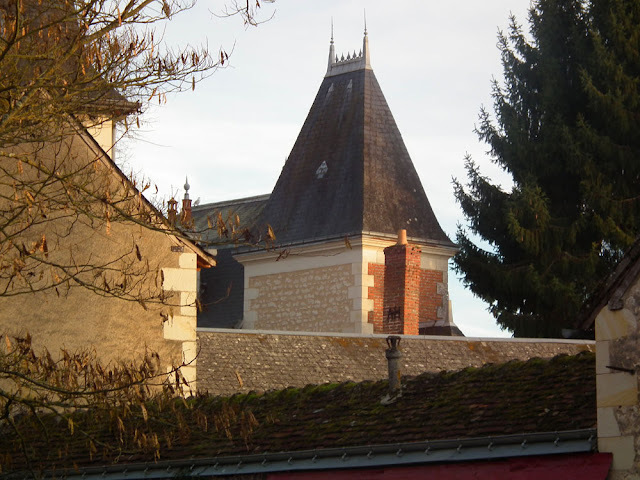 My Cake Club friend Maureen told me that she has been fascinated by the Chapelle de Tous les Saints and its danse macabre ever since she arrived in the area in the 1990s. In the past she had asked people about it, but never got much information. She was delighted when I told her I could get the key and we could visit the inside. 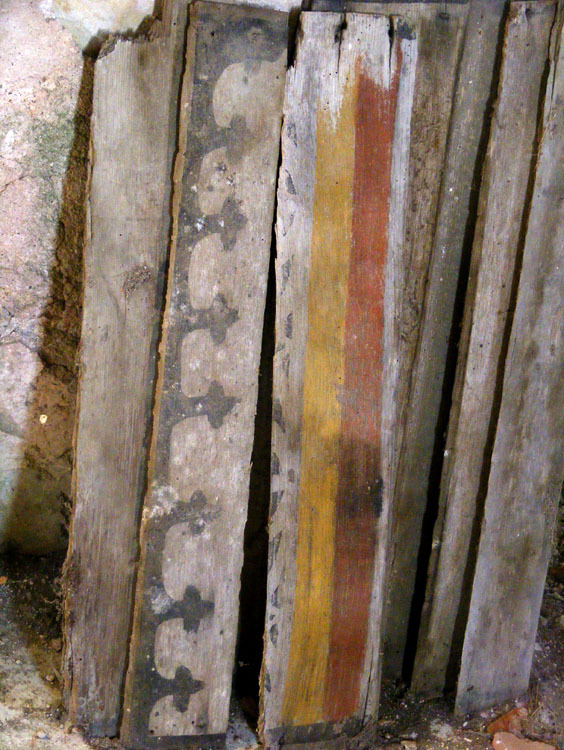 Painted oak panels which have fallen from the ceiling and been stacked up against a wall. 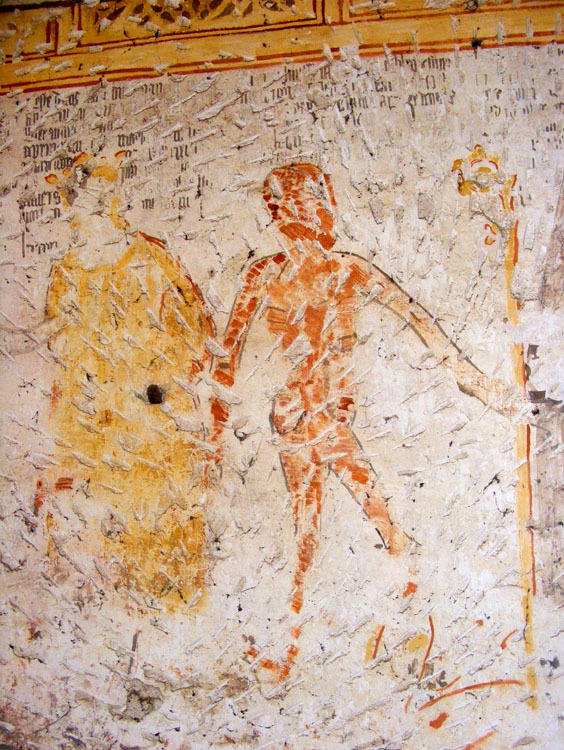 The light was rather good on Wednesday afternoon when we were there, so I took some shots of details of the brushstrokes on the wall paintings and of the decoration and degradation of the ceiling. 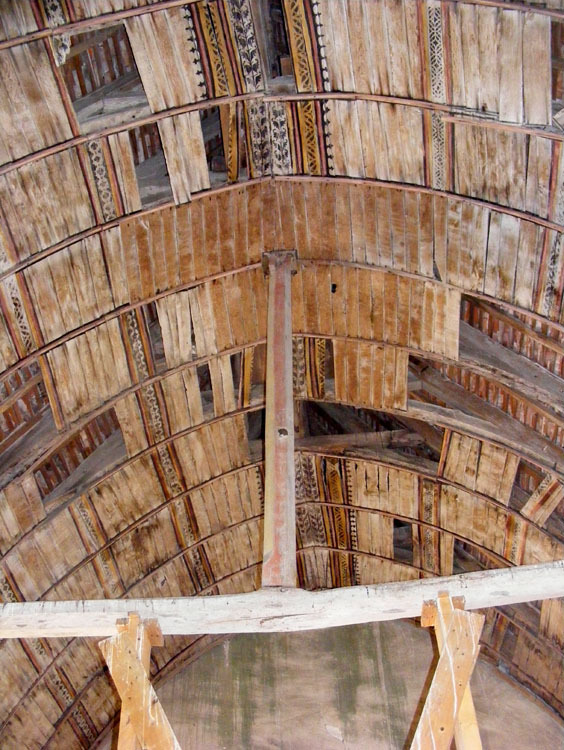 The ceiling, with big chunks missing and on the floor. 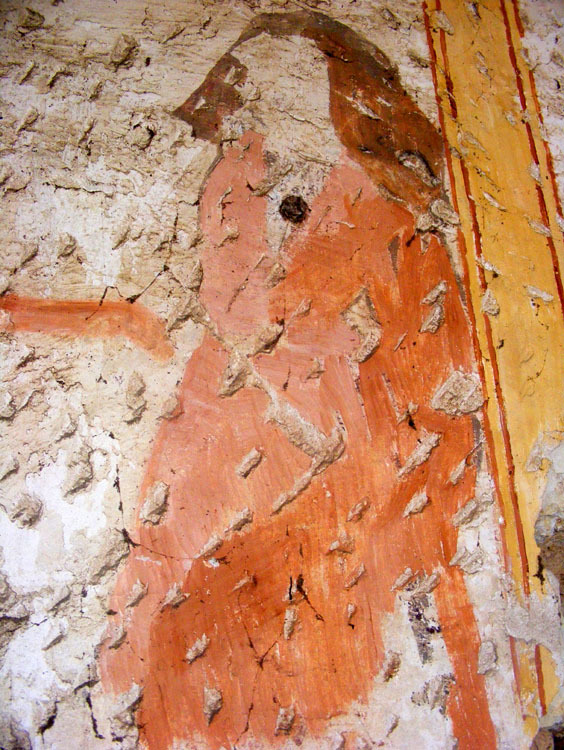 I noticed for the first time that the king post is painted too. While we were there several random passers by who stopped to take a peek. One was Albert, who is Preuilly's retired postmaster, and is a member of the local history society, so knows all about the chapel. The next was a guy from the council who was checking for water leaks in the pipes under the street. The third was an elderly woman who said she had never been inside before. but I'm a bit suspicious that it is 20th century 'restoration'. There are a number of other people that I am aware want to visit the chapel so I will be arranging something for early April. If you haven't already done so, let me know if you are interested by emailing me (via the link to my profile on the right side bar). One of the best preserved of the women in the danse macabre. You can see that the paint for her gown is not evenly mixed and has come out a bit streaky. I'm pleased to be able to report that the fundraising account with the Fondation du Patrimoine has reached €7200. Many thanks to all who were able to contribute. Even donations of a few euros build up when lots of people help. To read more about Preuilly's Chapel de Tous les Saints, its historic significance and current need of conservation click here. Loire Valley Nature: A new entry has been added for the toxic plant European Birthwort Aristolochia clematitis. It and others of its family are contenders for being the plants most likely to have caused the most harm to humans over the centuries, but I'll bet most of you have never heard of it. The story of how scientists in recent times learned how poisonous it was is both horrifying and fascinating. Common Honey Fungus Armillaria mellea (Fr. Armillaire odeur de miel), shown in the photo below, is all over the forests, parks and gardens here, but can't rival its humungous American cousin. Well probably. 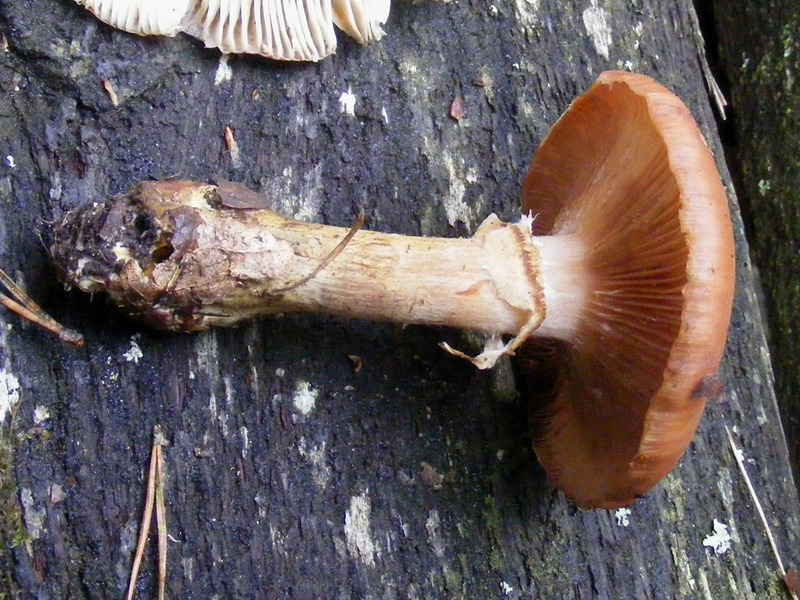 It is widely believed that a colony of Dark Honey Fungus Armillaria solidipes (syn. Armillaria ostoyae) (Fr. Armillaire à squames foncées) in the United States is the largest living organism in the world. It's been nicknamed the Humungous Fungus, is somewhere between 1900 and 8650 years old, extends over 9.6 square kilometres, and may weigh as much as 550 tonnes. If the fungus is all one organism, which seems likely based on DNA tests, it is the largest by area, and possibly by biomass. Dark Honey Fungus growing in a ditch in the Forest of Preuilly. On the last fungi foray to the Forest of Preuilly, at the end of the outing I crossed the ditch around the carpark and noticed a solitary brown mushroom growing out of the accumulated leaf litter. I dutifully dug it up and presented it to be identified. 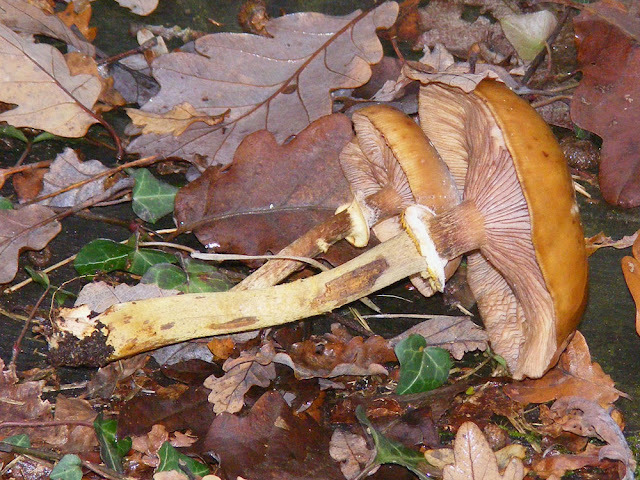 To my surprise it turned out to be Dark Honey Fungus. I assume it isn't going to turn out to be rivalling the Oregan monster, but I was intrigued to see a species with such a reputation in my local forest. 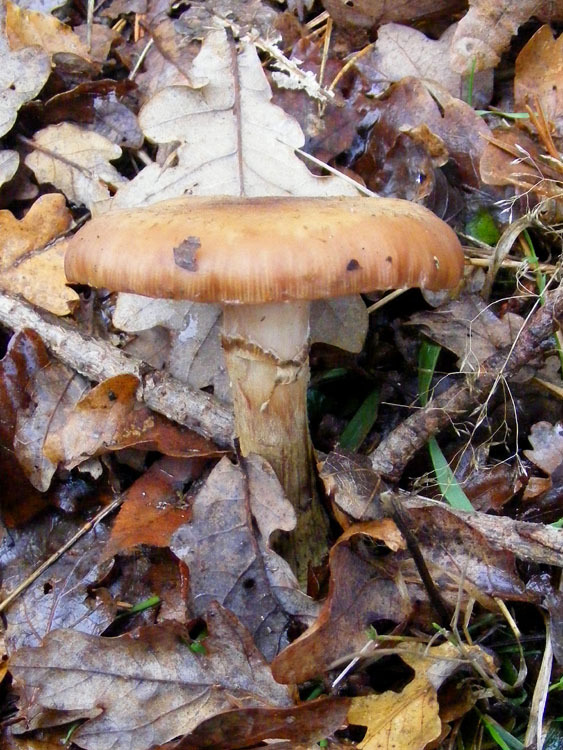 Dark Honey Fungus (compare this to the photo of Common Honey Fungus above). CHF has a yellow stem ring, DHF has a white stem ring with brown scales underneath. Loire Valley Nature: A new entry has been added for the tiny rare riverside plant Strapwort Corrigiola litoralis. 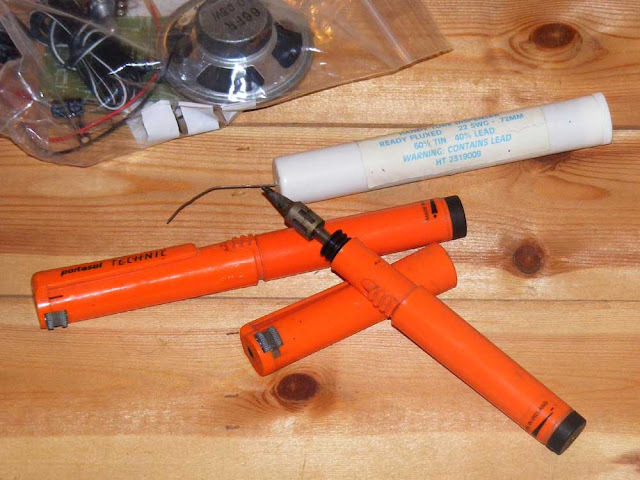 In October I received a phone call from Tim B, asking if I own a soldering iron (yes) and if he and Colin could borrow it (also yes) as they were needing to repair Tim's oil burning furnace. The pump had stopped working and was carefully laid out in pieces on the dining room table, and as most of France was expected to arrive within two hours for Gaynor's legendary curry evening there was potential disquiet in the household. Well - you can relax, because the mystery has been solved. Apprently, the last time I had used the soldering iron had been to do a running repair to a Traction Avant headlight bulb (as seen here), because the whole ensemble was in my box of spare brake light and indicator bulbs. This is a good thing, because Tim B has sent me a kit to make a little amplifier. My plan is to get a 1960s or 70s radio that isn't working, and rebuild it as an entertainment unit to take on car club outings. 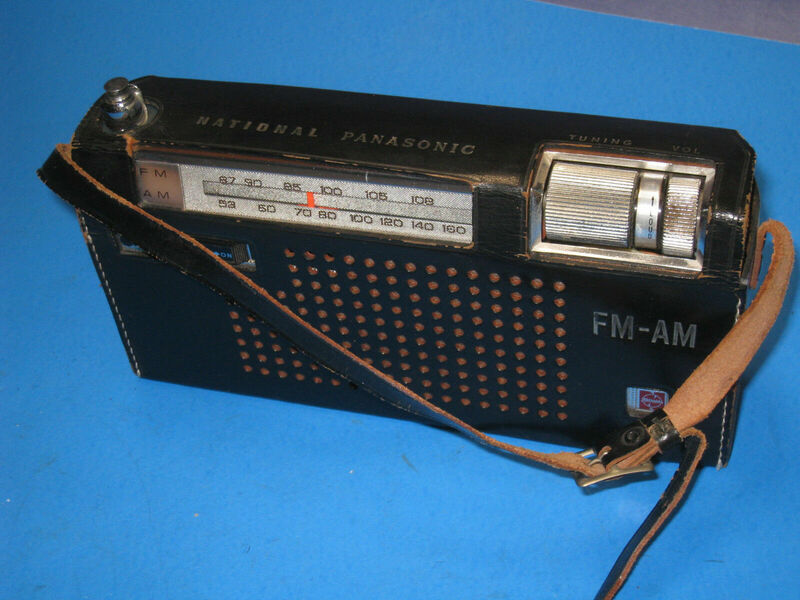 At the moment I fancy something like a Panasonic leather cased trannie like this, but I may yet use a 1950s bakelite job along the lines of this beauty. As I won't be spending any money on this project it depends what non working item I can find at Fabien's or at a brocante, so who knows what I will end up with! The project will start when I know what I will be fitting the amplifier to, and when my magnifying headpiece arrives. These photos showing 17th century architectural detail are of Preuilly's 'second chateau'. 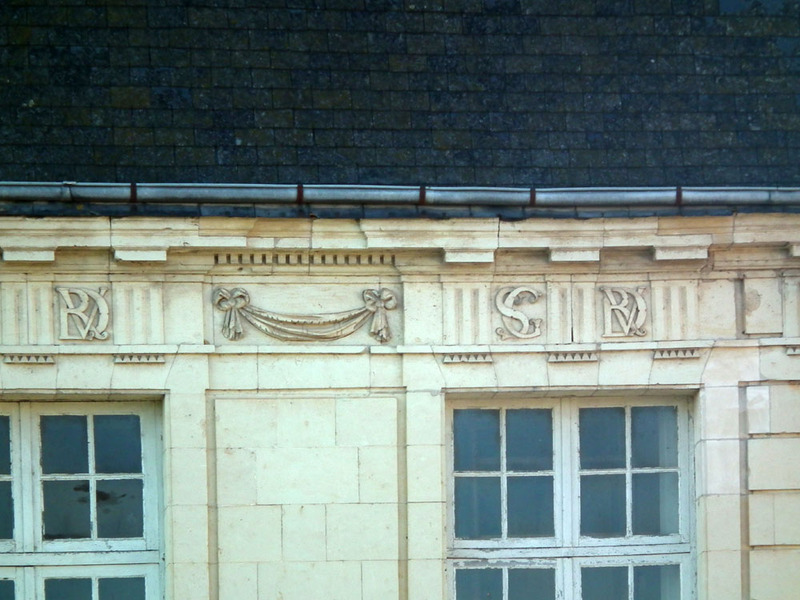 La Rallière was built by Samuel Gaudon (hence the SG monogram in the cornice). 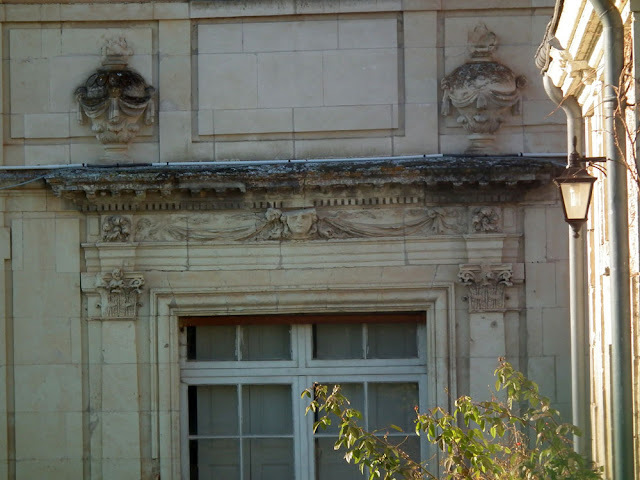 It is to my mind a much grander building that Preuilly's chateau proper, but strictly speaking it is a hôtel particulier (grand town house). 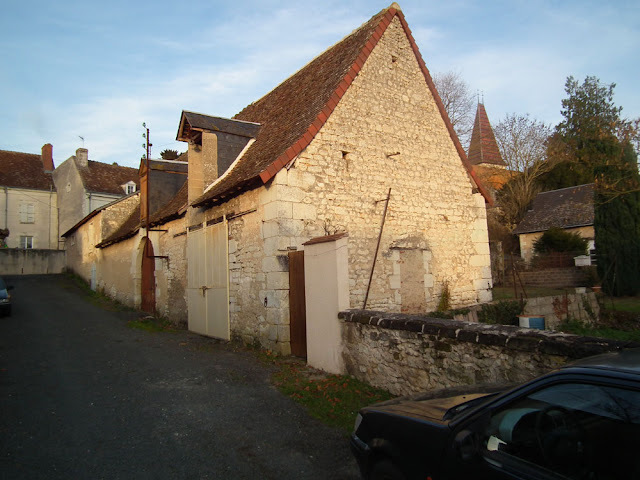 Gaudon was born in Preuilly, Protestant, and made a fortune market gardening on the outskirts of Paris*. The building was never finished and today is a privately owned holiday rental. 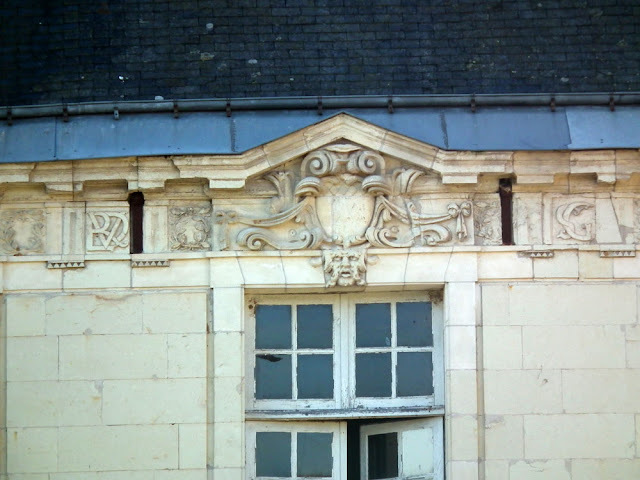 Compromised during the Fronde, a period of political unrest, Gaudon was imprisoned in the Bastille in 1649 and building work came to an abrupt halt. *I can't remember where I got the information about Gaudon being a market gardener. CHM has pointed out to me that the real money came from the fact that he was one of Louis IV's tax farmers. 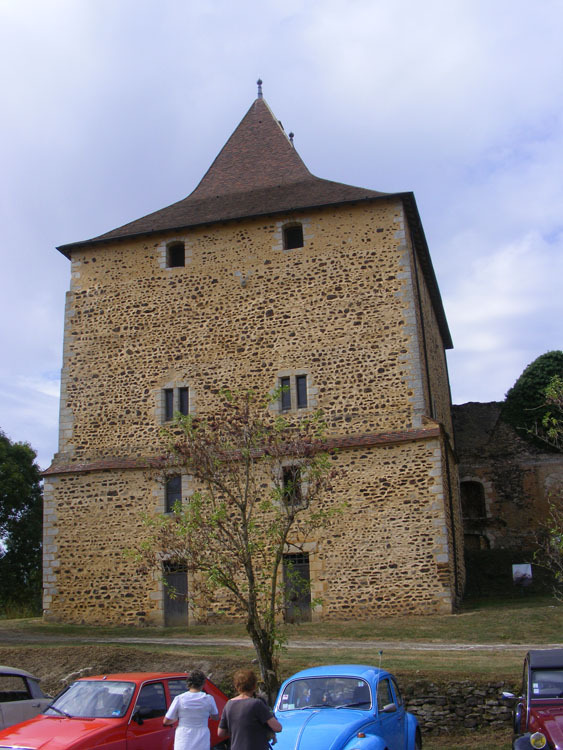 In the north of the département of Cher, between the vines of Sancerre and Menetou-Salon in the commune of Neuvy-Deux-Clochers sits the Vesvre Tower. 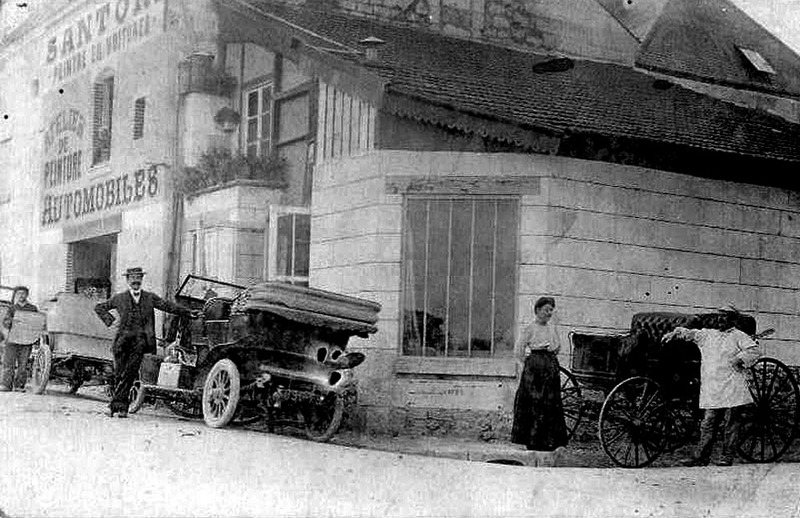 Vesvre grew in importance in the Middle Ages because it was on the route between Bourges and Sancerre. 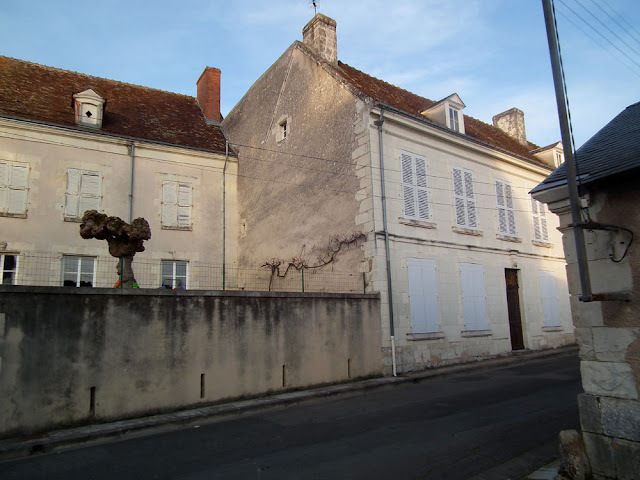 A massive fortified rectangular house with thick masonry walls was built in the middle of the 12th century by Hugues II de Vesvres on the vestiges of an earlier aristocratic home which dated from the 11th century or even earlier (maybe the 9th century). Along side the tower is a complex of buildings and earth works, including the much older original motte and the farm and farmyard from the 13th century (remodelled in the 16th century). 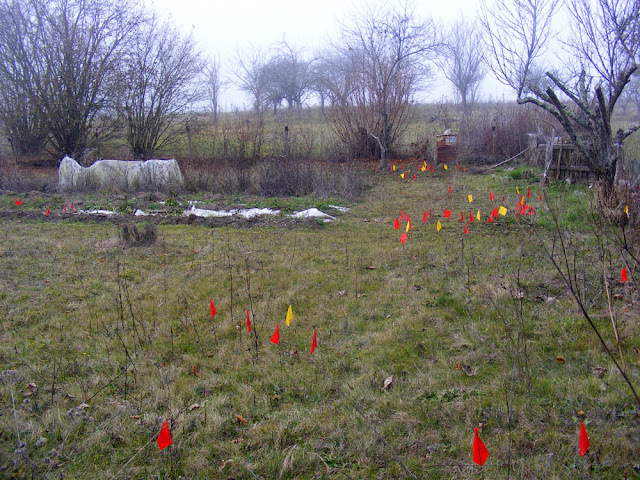 Archaeological studies have revealed a system of defensive ditches, hedges and palisades. 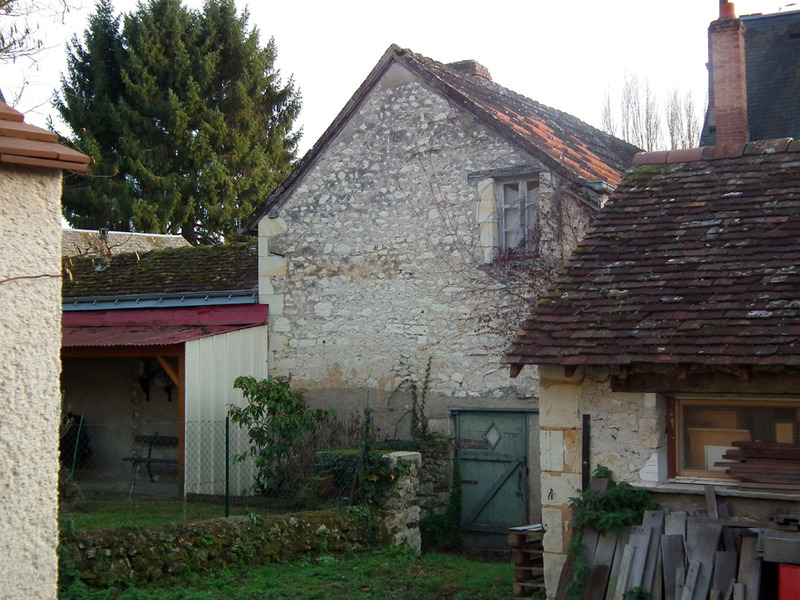 The buildings became the property of the local commune in 1973, since when the site has had extensive renovation and archaeological work undertaken. The fortified house was built on a square platform surrounded by a moat and defended by a lookout tower at each corner of the mound. The building has been much altered and remodelled over the centuries and only took on its current appearance in the 17th century. 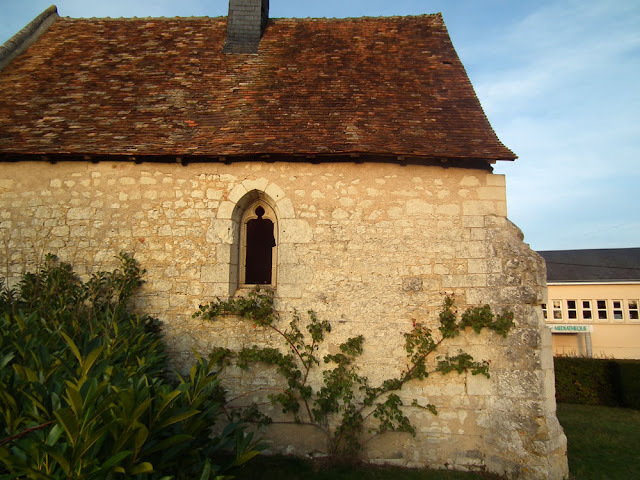 At the end of the 15th century Renaissance style lodgings were added to the west, but they are now in ruins. To the north there are the vestiges of other buildings from this period, but what their purpose was is now difficult to interpret. 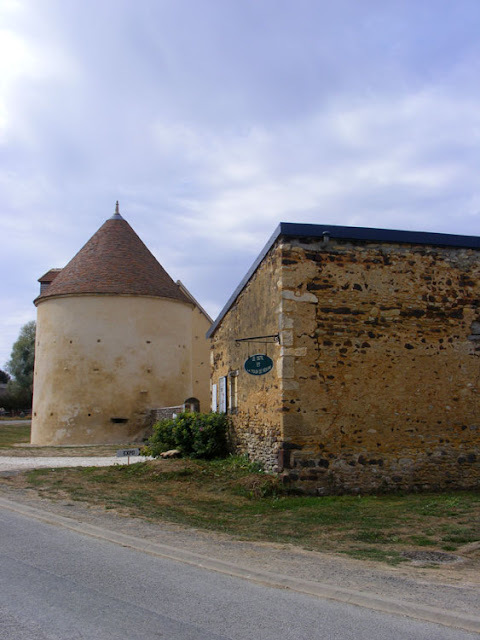 Dovecote and barn of the fortified farm of Vesvre. The existing buildings of the fortified farm are estimated to be no earlier than 1500, but the archaeological digs prove that the farm had been fortified in the 13th century. Both the dovecote and the outer barn wall form part of the fortifications. Originally there was a drawbridge between the farm and the tower house platform. There is documentary evidence of a chapel here too, which has now completely disappeared. It would explain the otherwise mysterious origin of the name of the nearby village, Neuvy-Deux-Clochers. The village only has one church ie only one belfry, not two, yet 'Deux-Clochers' means 'two belfries'. Anyway, it's a jolly impressive tower house, and with its red sandstone blocks, clearly Berrichonne rather than Tourangelle. It is open to the public and I could have gone in, but my friends and I had an appointment with the cheese producer across the road.